The work of Peace Mala is not a luxury or a decoration. It is about transforming the lives of children who may be sad, lonely, and rejected, into children who feel useful and important members of society. For those children who are more fortunate, it is a way of reaching out to their brothers and sisters all over the world in love and affection, the foundation for true world citizenship. We are happy that so many entries have shown this spirit of generosity, and that the years of Peace Mala activity are bearing such wonderful fruit. This is the seventh year of the project and the fourth annual International Awards for Youth. The quality of entries has pleased and surprised the judges by their range and excellence. The chief characteristic of all the winning entries in the Junior Section has been the enthusiasm of the children and the commitment of the staff, especially where it has become a whole school project and completely inclusive. 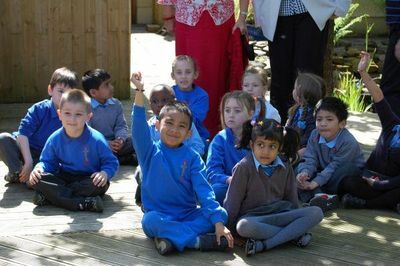 The children of Clase Primary, Swansea immediately responded to the message of resisting bullying and racism. They created and performed their own outdoor Rap version of Peace Mala, wearing rainbow tie-and-dye T-shirts which they had made themselves. Their teacher, Dave Bishop, recorded the event on DVD, and Special Needs pupils were fully included as all chanted Love- Friendship- Respect! The judges liked the presentation in a 'street-cred' medium, and the entry is an example of the inspiration of one teacher spreading outwards within a school. We are happy to give this entry a Highly Commended Certificate. 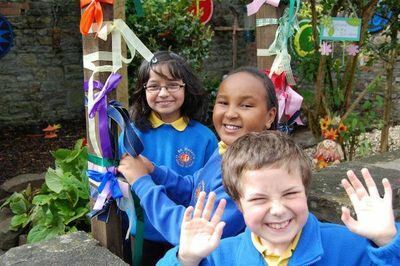 The entry from St Joseph's Cathedral School (Infants), Swansea (shown here in the Peace Mala Garden) demonstrates that the Head Teacher, Miss Anne Hacche and Deputy Head Mrs Kath Richards are committed, and that the Governing Body and parents expressed approval of Peace Mala. There is a special garden at St Joseph's, and it is planned to include the 'Golden Rule' messages of the various faiths in appropriate colours, with the visitors to the garden being welcomed by St Francis and his Prayer for Peace. The focal point of this entry was a DVD of a school assembly with singing and dancing on the Peace Mala theme. An innovative use of the Peace Mala bracelet is that one child a day wears it, and is The Class Friend, who assists any child who needs help. The school has bought a Peace Mala banner, and its outgoing approach is an exemplar of the injunction of Jesus to 'love one another as I have loved you'. We are happy to place this school Third Prize among the Awards received. Next in the Junior section comes Coaltown of Balgonie Primary School, Fife, Scotland. This school is noteworthy for the fact that it weaves the Peace Mala 'Golden Rule' principles through all its activities, and is also an ECO School. 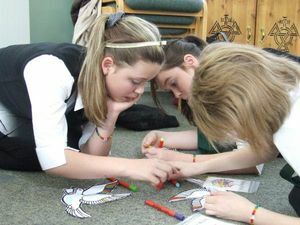 The United Reformed Church had funded every child to receive a Peace Mala bracelet, and the particular initiative that impressed the judges was the idea of a Peace Box. This was moved around to various locations in the Community, e.g. the school, the library, and the public house! In the Box, children and adults can post their wishes for the community, to form a display, and be presented to the Community Council. There were also themed activities in the school e.g. collecting creation stories from around the world. For its pro-active and community integration, we are glad to give the Second Prize in the Awards to this school. The students put together a radio programme about their visit to Cardiff and collection of their award. It is a lovely description of the ceremony and contains interviews with some of the people who attended, including Bonnie Tyler. 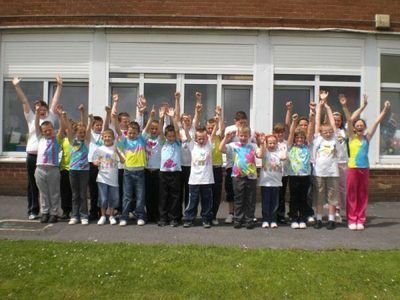 The impact of the Peace Mala message on the Hafod Primary School, Swansea, is immediate: a rainbow encircles the school on the outside, and another one threads through all the rooms on the inside. The Headmistress, Rachael Webb, has fully embraced the Peace Mala and has links with schools in India, Spain, Lithuania and Poland. 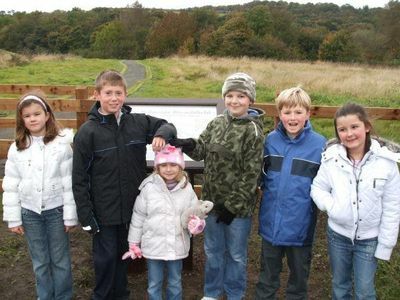 Some of the pupils are shown here in the Peace Mala Garden. Mothers and grandmothers feel confident to come to the school, and an adjacent wasteland has been transformed into a garden 'for all to enjoy'. The roof supports a Global Faith Garden where plants are grown from seed by the children. It is a multi-cultural haven which also celebrates the industrial history of the Hafod with a visual timeline enhanced by the paintings of Valerie Ganz, a famous Welsh artist who depicts the mines of Wales, and a strong contribution from the school's art teacher. 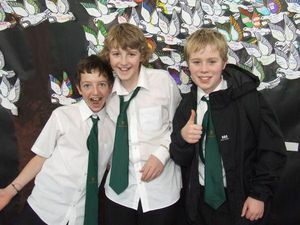 The school represented Wales in London, where it received a UN Inclusiveness Award, and is an ECO school. There is a positive reward system, and a 'Values Cabinet', from which each month a value such as Tolerance is studied, and ideas sent home for the community to consider and share. With the keynote Happy, hopeful, healthy, helpers well exemplified, we are delighted to give this school an Equal First Prize Award. St Helen's Primary School, Swansea, is outstanding in its commitment to Peace Mala principles by the Head teacher, Jayne Woolcock, all the teachers and pupils and the parents. 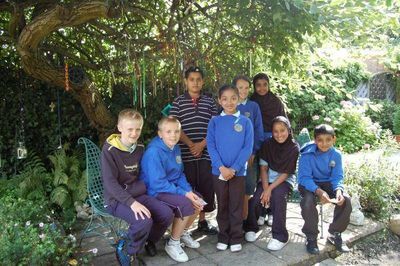 It is an ECO school, and with its motto All equal, all different, it cherishes its pupils from many different countries of origin and many diverse first languages, here are some of them in the Peace Mala Garden. The outstanding presentation folder (a work of art in itself!) reveals how the children made a power point presentation to 'educate' the staff, as well as their own leaflet, and newspaper, how they sent poems and messages to Federico Hewson in Amsterdam for the Valentines' Day Project in partnership with Peace Mala, and how they made the symbols for the Peace Garden recently opened by the Lord Mayor of Swansea, Cllr Alan Lloyd. The Head Teacher had visited the Head of a Bangladeshi school as part of the Bangladeshi Friendship Project, and had given her a Peace Mala bracelet. The school supports Fair Trade, Community Recycling and is a Healthy Eating school. The school hosted the launch of the City of Sanctuary. For fully integrated principles of diversity and inclusiveness, with a whole school policy, and total involvement of children and parents, we are delighted to give this school an Equal First Prize Award. The characteristic of the winning entries in the Senior Section has been their diversity and inventiveness. The entry from the Step-Ahead Education Centre, Cockett, Swansea, was remarkable for the rapid and intuitive grasp of the idea of Peace Mala which the students had demonstrated. 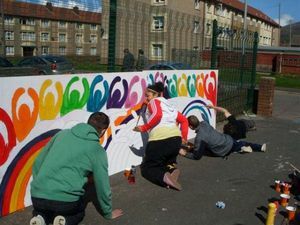 All have had challenging and distressing experiences, yet showed that they could co-operate in one project to dramatic effect. Each student designed and made a circular decal for a poster in a bracelet-like arrangement. There was distinctive individual artistic talent, and memorable epigrams such as If it harms you it harms me and We are all one Soul. The 'beads' of the 'bracelet' hung around one student's idea of earth, placed on a black background to signify space. The project was introduced by the Head of Centre, Simon Evans, and showed intelligent, thoughtful responses and effective teamwork. We are very happy to give this entry a Third Prize Award. 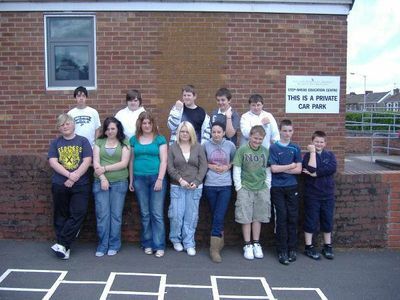 The entry from Trinity High School, Renfrew, Scotland consisted of an evidence DVD and descriptive account. The Peace Mala Bracelet was used for a one-day retreat at the start of the first year in Senior School. There were workshops on the theme of peace in the family, school, and community, and there are pre-existing links with a school in India, which gave a sense of belonging to the Indian pupils. Children asked to make additional bracelets to give as a present to someone they wished to make peace with. There were meditations on the themes of children living in war-disrupted places, where these were, and a reflective exercise on how the children ranked themselves as peacemakers, and on what might cause them to 'break the peace' at home, at school and in the community. The values of tolerance and respect were encouraged as the anti-dote to disharmony. Making the Mala was seen as a sign of the school's commitment to peace and tolerance in the world. The whole day was an excellent introduction to the new school year, an ice-breaker with ethical significance, and set the foundation for all the new pupils to settle in harmoniously with one another. They had evidently enjoyed the day greatly. This whole-year approach was admirable, and we are very happy to give a Second Prize Award to this school's entry. 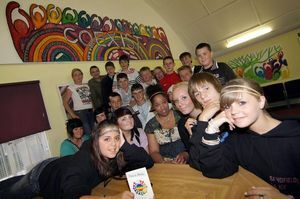 The film made of the Youth Inclusion Programme, Port Talbot, in conjunction with Cultural Fusion Wales, and a Community Artist was outstanding, and technically accomplished, but most importantly clear evidence of the huge positive effect the Peace Mala project had had, and continues to have, on some of the most disadvantaged youngsters who attend this unit. They threw themselves into the musical, visual and kinetic activities with creative energy, and the film emanates a sense of fun, belonging and good humour. Engage…Facilitate…Empower were the watchwords, and the talented group composed their own music and libretto. The beach shots and the use of snooker balls to display the faith symbols were ingenious. The combination of keen staff, links with like-minded agencies, and the adoption by the students of the idea of the Peace Mala as something they could 'own', was irresistibly appealing. We are delighted to give this entry a First Prize Award. Peace Mala is extremely grateful to all those who have sponsored and supported the 2009 Youth Awards.